a very old variety. Intense fruity flavour also used for cooking and cider. The origin of this variety is uncertain but it probably arose in England. It was recorded by Parkinson in 1629 and was well known by the late 17th Century. Claimed to have arisen at Parham Park, near Arundel, Sussex. George Washington ordered the variety for his garden at Mount Vernon, Virginia, but it failed to flourish in the USA. Widely grown commercially and in gardens in the 18th century. Small/medium sized fruit. Round-conical to oblong shape. Slightly ribbed. Golden yellow background skin colour with many bold russet dots and some russet at the base. 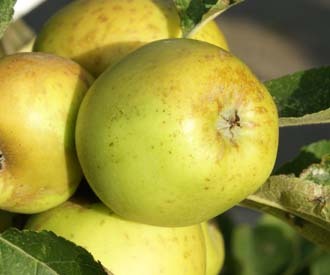 Pale yellow flesh with an intense, brisk, fruity flavour. When cooked it keeps its shape and was used for ‘Pippin’ jelly, tarts. Has also been used for cider making.